Spooooky. 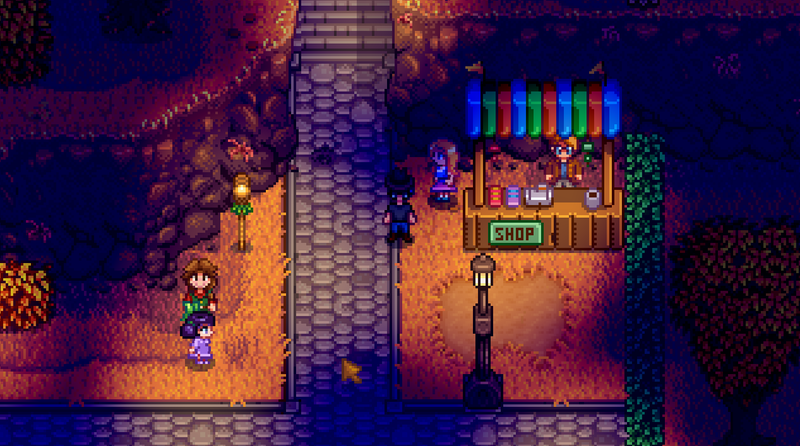 Halloween is alive and well in Stardew Valley - but here the folks call it Spirit’s Eve, instead. Taking place on the 27th of Fall at 10 pm every year, Spirit’s Eve is one of the niftier events, and it boils down to two main attractions. It’s not a terribly involved gathering, but if you’re hurting for money you should definitely consider stopping by. Because Spirit’s Eve doesn’t start until 10 pm downtown Pelican Town will be closed off for pretty much the entire day. This is more irritating than with other festivals, as you still need to find something to do until then. Try to plan around this fact in advance. 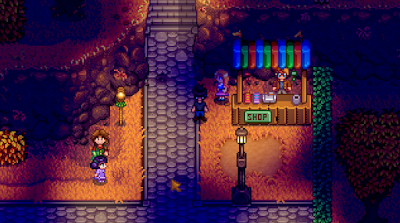 As with most of the festivals, Pierre has a small selection of unique items available during Spirit’s Eve. You can find him near the entrance of the grounds, in a distinct booth. You can’t get these items at other times of the year, so you should bring lots of gold along. The primary draw of Spirit’s Eve is the enormous hedge maze in the north. Though it initially sounds like a contest of sorts, the maze is really just a slightly-more-confusing area to navigate, and you have as much time to do so as you like.There are plenty of NPCs stuck in the depths of the maze, presumably because they don’t have a birds-eye-view of the grounds. You can find your way through by taking a right at the entrance, then the first left, and weaving inward from there. In the north you’ll see a small, faux cemetery, and near it a sign with a question mark. You can go through the hedge beside the question mark and slip a bit further north to find a cave. Walk through it to the east and you’ll find a Golden Pumpkin in a chest on the other side. This Pumpkin is the primary draw, as it will net you a hefty 2,500 gold profit when sold - a nice little nest egg for Winter. Nothing else. All done. Head back towards your house to jump to 12 am and end the festival.